Sue Mosbacher prepares fruit for canning. 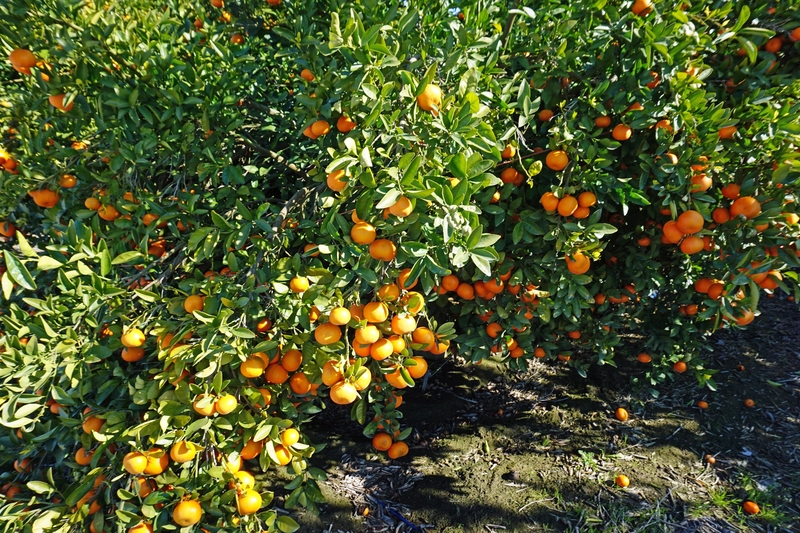 Winter is the time when many backyard citrus trees and roadside fruit stands are laden with mandarins, lemons, navel oranges and limes. 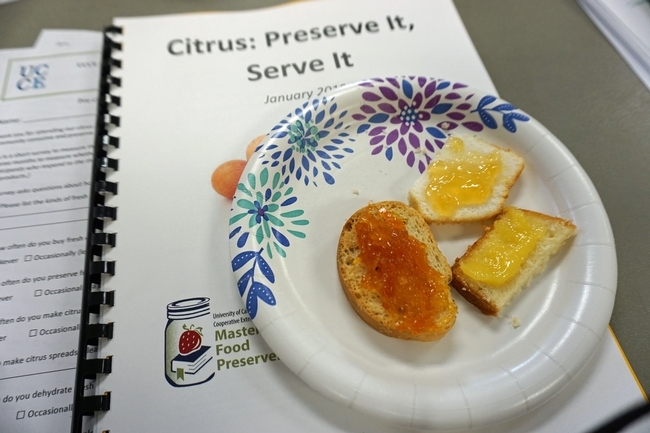 A UC Cooperative Extension expert is traveling the state to teach how the fresh taste of citrus can be preserved for year-round enjoyment. UC Cooperative Extension Master Food Preserver coordinator Sue Mosbacher recently taught a roomful of attentive Mariposa County residents how to safely make marmalade jam, preserve lemons in salt to add flavor to savory dishes, and can grapefruit and orange sections with a little sugar to produce a fresh-tasting citrus cocktail high in vitamin C.
Mosbacher is a community education specialist based in El Dorado and Sacramento counties. 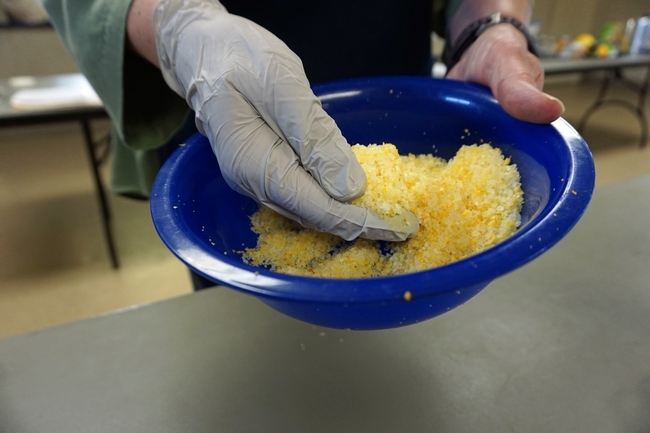 But she has been driving up and down Highway 99 to bring research-based food preservation lessons to residents as far south as Madera County as part of a special project that was funded with a $140,000 specialty crops block grant from the California Department of Food and Agriculture. Mosbacher has made dozens of appearances at county fairs and community meetings. 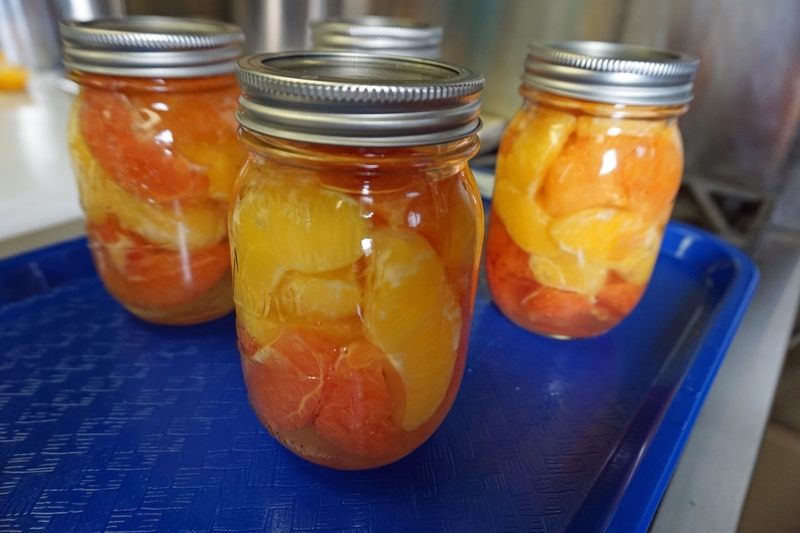 The series began last year with lessons focused on preserving summer fruit. The citrus classes are being offered in the winter. 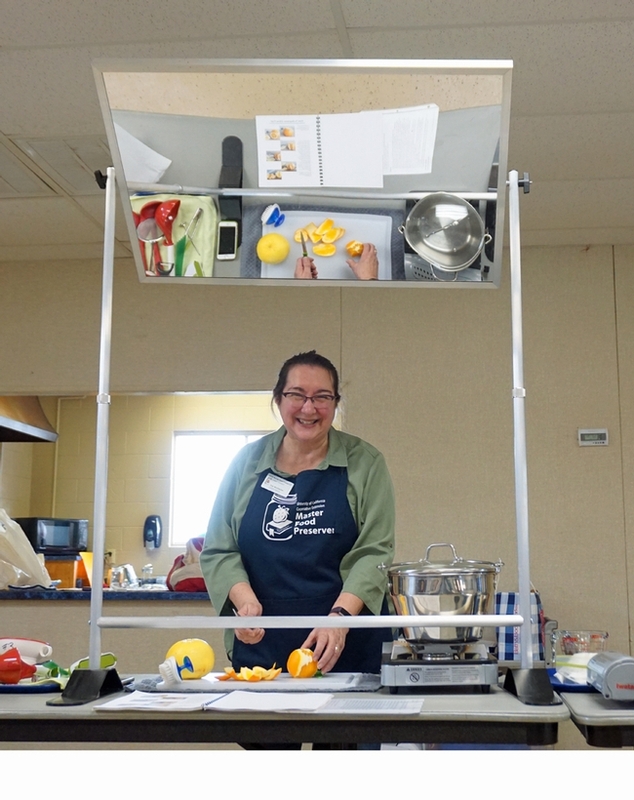 And in late spring 2019, Mosbacher will be on the road again to teach more fruit preservation classes and, in summer and fall of 2019, she will offer vegetable preservation lessons. The project is slated to conclude in 2020. Master Food Preserver Barbara Mattice, left, helped Mosbacher demonstrate citrus preservation in class. Mosbacher said she is energized for this journey by knowing that she is making a difference in California communities. 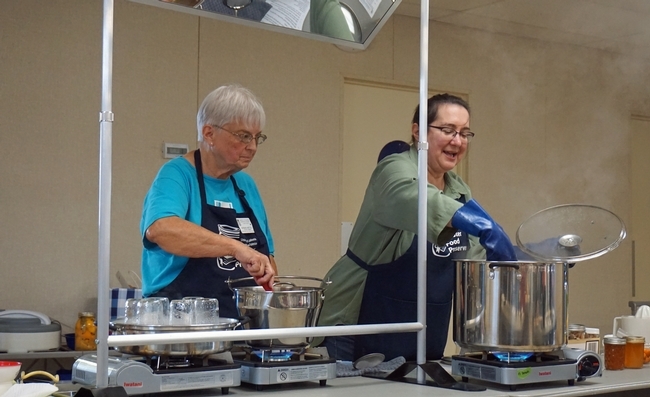 She shared a telling story from a Georgetown vegetable preservation class. A participant said she had canned peas using the boiling water method; the Master Food Preserver Program guidelines require the use of a pressure canner for low-acid vegetables to prevent the growth of bacteria that produce the botulism toxin. Mosbacher has a background in computer science and the financial industry. During the 2008 downturn, she was laid off and spent time as a 4-H volunteer in the UC Cooperative Extension Office. 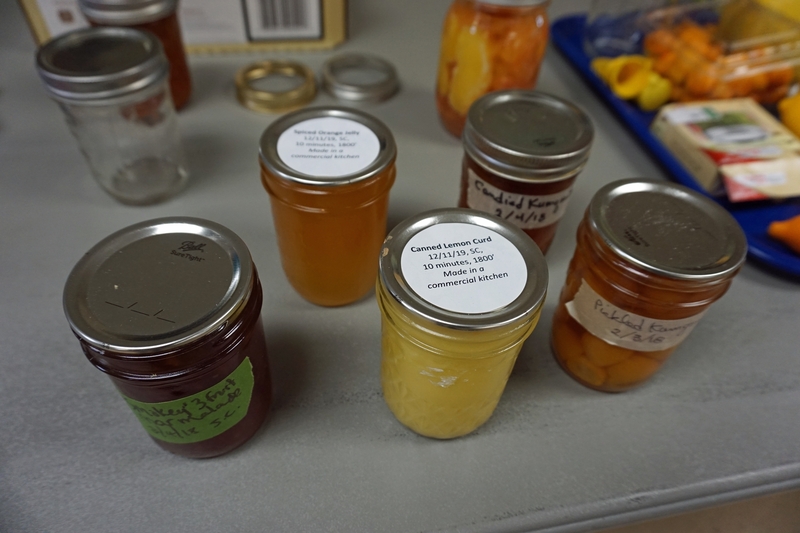 While there, she learned about a part-time job opportunity working with UC Master Gardeners and UC Master Food Preservers. At the time, she had no food preservation experience, so she took Master Food Preserver training. “I learned everything I know from our own Master Food Preservers,” Mosbacher said. Most citrus fruit is ready for harvest in the winter. It can be preserved a variety of ways to enjoy it year round. Master Food Preservers are volunteer food preservation enthusiasts who have been trained in research-based preservation methods. Every food preserver training begins with a food safety primer with proven methods to decontaminate kitchen surfaces and tools, detoxify canned low-acid food and guard against spoilage. At the citrus training, Mosbacher demonstrated canning a delicious orange jelly spiced with cinnamon, allspice and cloves. After cooking the juice with sugar and pectin, she canned the jelly using the boiling water method and with a steam canner. Either option is okay with high-acid citrus fruit. Options for preserving lemons abounded. The juice can be frozen in an egg carton or ice cube tray, and used throughout the year in salad dressings, fruit salads, soups and ice cream. Slices of lemon can be dried to flavor ice water, seafood and casseroles. Mosbacher demonstrated preserving lemon wedges in salt water seasoned with bay leaves, cinnamon sticks and whole black peppercorns. She provided a recipe for a gourmet chicken tagine and roasted fingerling potatoes with preserved lemons to give participants guidance for using their preserved fruit. At all the classes, participants are surveyed at the beginning and end to document the impact of the training. The preliminary results calculated with responses from 75 participants reflect positive results. 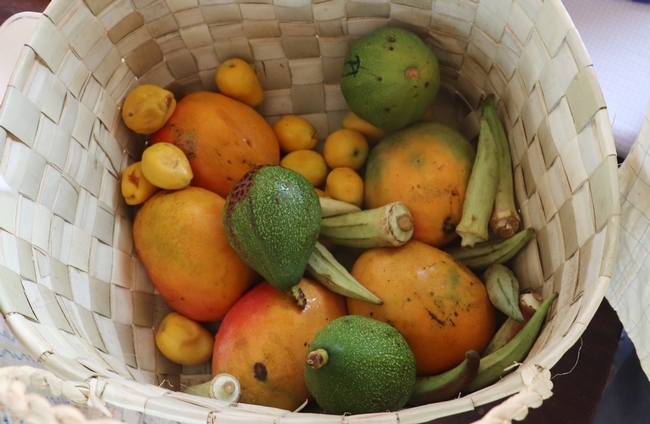 After the class, nearly half of participants intended to preserve more fruit at home than they previously preserved. Two-thirds of participants intended to dehydrate more fruit than before. 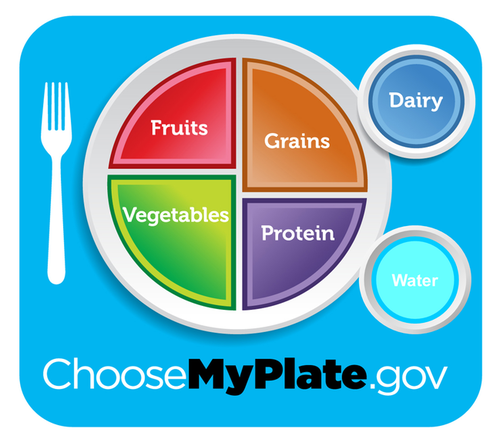 "The results are great," said Katie Johnson, UC Cooperative Extension nutrition, family and consumer sciences advisor in the Central Sierra. "We never see results this high with regard to health behaviors, so I think it's pretty exciting." To learn about food preservation programs around the state and search for classes, visit the UC Master Food Preserver website. Canned wedges of grapefruit and oranges. Lemon zest and coarse salt can be combined to make a long-lasting seasoning for fish, salads and other foods. Class participants tasted spiced orange jelly, lemon curd and orange marmalade. Citrus may be canned in many ways, include jellies and marmalades, pickled and candied. The U.S. honey industry is thriving, according to a new study from the University of California Agricultural Issues Center (AIC). The research found that the U.S. honey industry in 2017 was responsible for more than 22,000 jobs and its total economic output was $4.74 billion. Total economic output includes direct effect, such as workers hired to move beehives, indirect effect, like packaging supply companies for honey products, and induced effects, the wages honey industry workers spend at local businesses. The study was directed by Daniel A. Sumner, an economist and director of the AIC, an institute which has studied the economic impacts of many farm commodities. 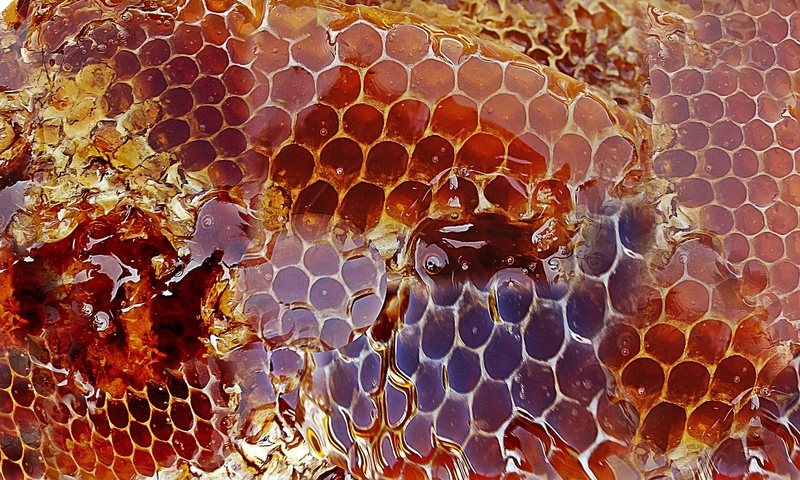 The U.S. honey industry is made up of beekeepers, importers, packers and processors. "The U.S. honey industry contributed significantly to jobs and economic activity across many states and regions in the United States," Sumner said. "In addition to its direct economic contributions, as an important ingredient, honey contributes flavor to a wide variety of food products and stimulates demand across the food industry." The honey industry contributed approximately $2.1 billion in value added to the U.S. gross domestic product (GDP) in 2017. For scale, Vermont Maple contributed $34 million to the Vermont economy in 2013. "While beekeeping is a labor of love and the true essence of a craft industry, the honey industry's size and scope shows that honey production makes a significant impact on our nation's economy," said Margaret Lombard, CEO of the National Honey Board. "From beekeepers in Washington state to packers in Maine, the honey industry's impact is evident across the country—as well as in the overall U.S. GDP." In 2017, the honey industry employed more than 22,000 individuals across the U.S. in production, importation and packing jobs. The Vermont Maple industry employed 4,021 in 2013. In addition to a thriving industry, the American appetite for honey is growing. In 2017, Americans consumed 596 million pounds of honey or about 1.82 pounds of honey per person, which represents a 65 percent increase in consumption from 2009 to 2017. To learn more about the University of California Agricultural Issues Center, visit https://aic.ucdavis.edu. 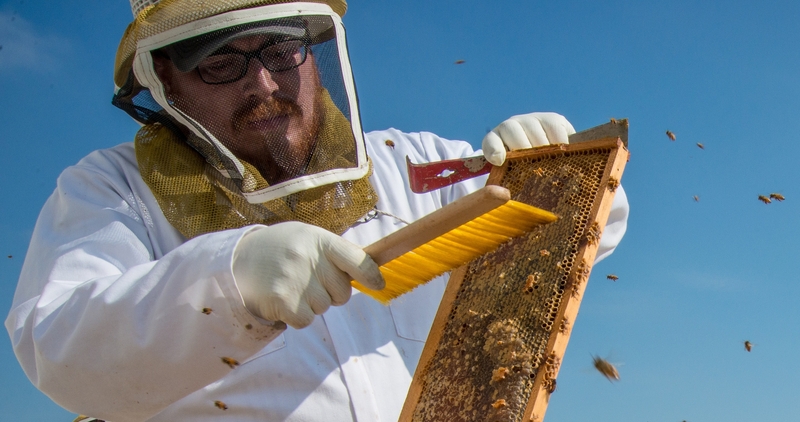 Find the full "Contributions of the U.S. Honey Industry to the U.S. Economy" study here. For more information on the National Honey Board, visit www.honey.com. The National Honey Board (NHB) is an industry-funded agriculture promotion group that works to educate consumers about the benefits and uses for honey and honey products through research, marketing and promotional programs. The board's work, funded by an assessment on domestic and imported honey, is designed to increase the awareness and usage of honey by consumers, the food service industry and food manufacturers. The 10-member board, appointed by the U.S. Secretary of Agriculture, represents producers (beekeepers), packers, importers and a marketing cooperative. For more information, visit www.honey.com. The University of California Agricultural Issues Center (AIC) was established in 1985 to research and analyze crucial trends and policy issues affecting agriculture and interlinked natural and human resources in California and the West. The Center, which consists of a director, several associate directors, a small professional staff and an advisory board, provides independent and objective research-based information on a range of critical, emerging agricultural issues such as food and agricultural commodity markets, the value of agricultural research and development, farm costs and returns, consequences of food and agricultural policy and rural resources and the environment. The audience for AIC research and outreach includes decision makers in industry, non-governmental organizations and governments as well as scholars, journalists, students and the general public. 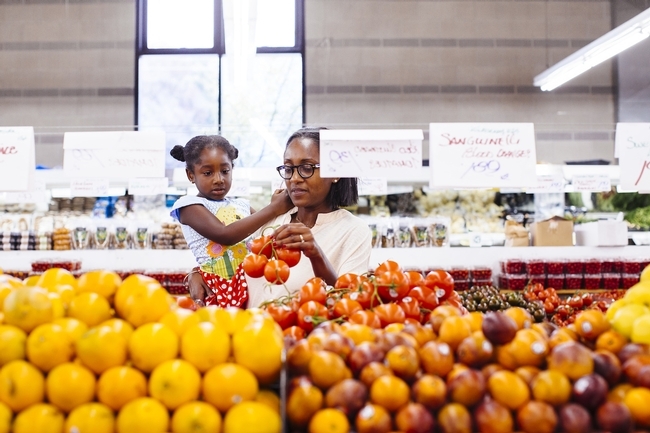 In a growing number of communities, food policy councils (also called “food system alliances”) have emerged to address gaps in local policies that focus on food. Most communities have transportation, housing or land use policies, but food policies are frequently missing. 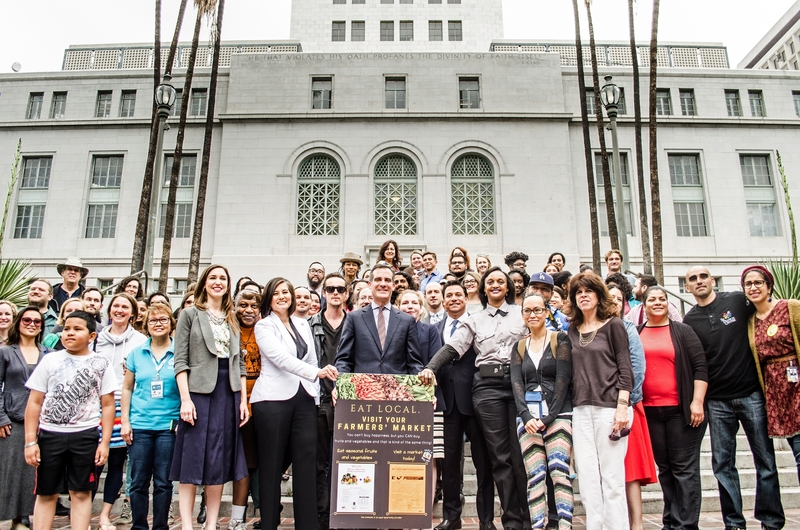 Food policy councils (FPCs) are an important way to bring community members together with local government to promote the social, economic and environmental health of local and regional food systems. 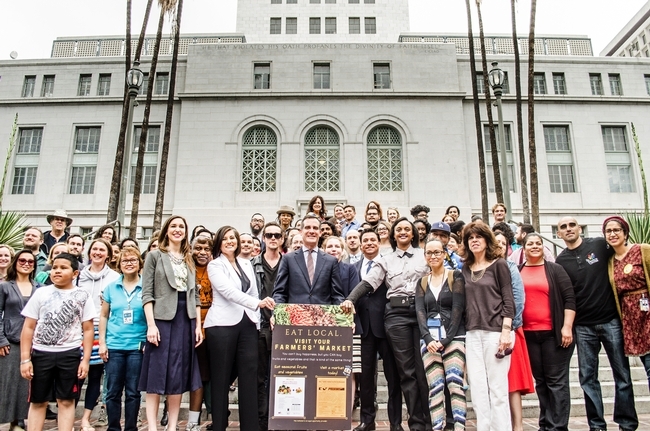 Food policy councils are made up of representatives from many sectors in the food system, including farmers, distributors, retailers, food service operations, government agencies (like public health, county social services and county agriculture departments), and community organizations that work in the food system. Some FPCs also develop close partnerships with county-based UC Cooperative Extension to help facilitate their work. 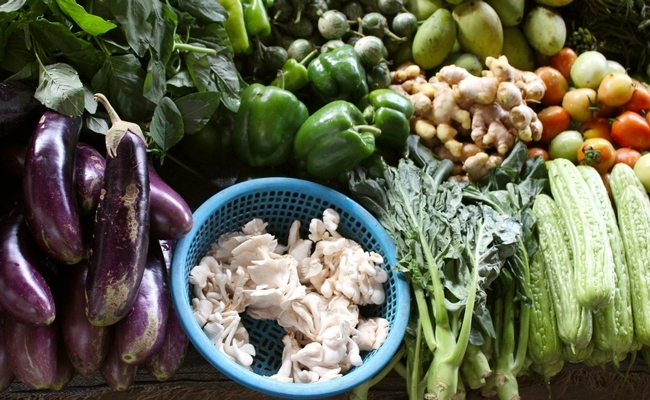 FPCs support a variety of food and agriculture-related policies and programs, including healthy food access, land use planning, regional food procurement, food waste, food and economic development, local food processing, and regulations related to urban farming or community gardening, to name a few examples. A group of Plumas-Sierra food policy council members at their October 2017 food summit. FPCs emerged in the late 1980s as the sustainable agriculture and food/nutrition movements began to pay more attention to community food systems. Early FPCs were created through resolutions of local government bodies (Clancy et al 2008). At that time, they tended to be embedded within government, much like a planning commission or a social service commission. As the local food movement began to rapidly expand in the 2000s, many local activists and organizations began to create FPCs as a way to bring together a more diverse group of food system stakeholders. These newer generation FPCs were typically organized outside of government as a non-profit organization or community coalition. Studies of FPCs, including our own, find that they take very diverse organizational forms and tackle widely varying issues, which means that generalizations about their goals and outcomes are difficult to make. This may be quite appropriate however, given the enduring FPC goal of tailoring food policies to the specific characteristics of particular places. While FPCs are increasingly on the radar of those trying to promote food system change, we still don't have much recent documented evidence about the actual work of FPCs (though see Harper et al. 2009, Fox 2010 and Borron 2003). In response, a team of UC Cooperative Extension researchers (Clare Gupta, Julia Van Soelen Kim, Dave Campbell, Jennifer Sowerwine, Gail Feenstra, Shosha Capps and Kate Munden-Dixon) began a comparative study of 10 California food policy councils in 2016. We wanted to know this: what are the networks and relationships that FPCs are a part of? And how do these networks and relationships influence what a FPC is able to achieve? 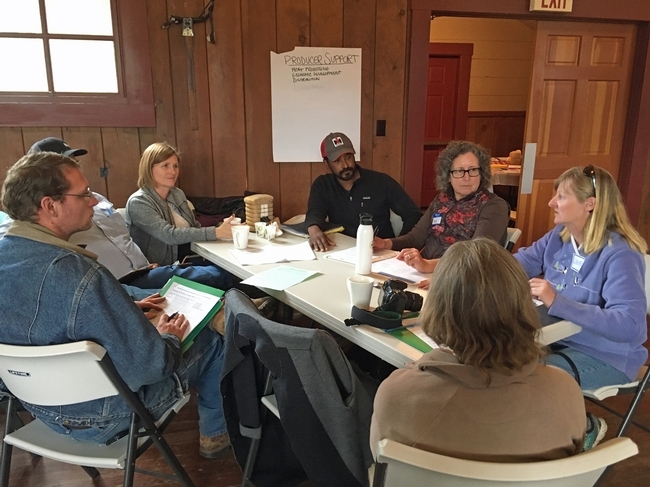 As UCCE researchers ourselves, we were especially interested in understanding the nature of relationships between FPCs and university researchers, including UC Cooperative Extension. To answer these questions, we interviewed more than 60 FPC members from food policy councils across California. 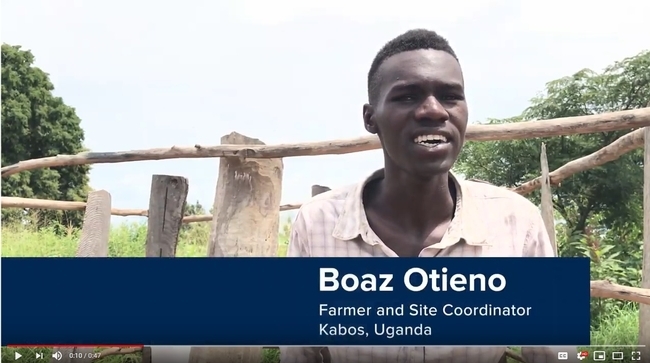 We asked them about the work they were doing within their councils, their relationships with other players in the local food system, and the way they find information relevant for their council's priorities. We also led focus groups with members exploring the same questions. In addition, we analyzed documents produced by and about FPCs. We also engaged in “participant observation” — researcher lingo for the process of engaging with groups and individuals as a way to learn first-hand about what they do. Lastly, we combined the stories we heard from our interviewees with numerical data from a survey of nearly all of California's known FPCs. We hoped by doing this to develop a better picture of FPCs' strategies for gathering relevant information, networking and creating impact. Respondents see information sharing as the most valuable FPC activity. It encourages collaboration and shifts participant thinking towards a more holistic view of food policy work. Members who are “knowledge brokers,,” including Cooperative Extension advisors, are connected to many different knowledge sources and are able to draw on these different sources to provide data and information that match their council's needs. Real-life experiences are often as compelling with policy-makers as statistics. FPCs cite the value of integrating information from numbers (i.e. quantitative data) and stories (i.e. qualitative data). There is no one-size-fits-all approach to FPC membership. Some FPCs view food system change as a process that involves a broad and inclusive consortium of stakeholders. They try to bring stakeholders with diverse values together (i.e., a “big tent” approach). Other FPCs emphasize attracting allies who share core values and a commitment to advocacy on behalf of food systems change (i.e., a “small tent” approach). Small sub-groups within FPCs can achieve significant policy change. A targeted sub-group of the FPC (i.e. working group; task force, campaign) can work with key allies to push forward a particular policy priority—the entire council does not necessarily have to be entirely involved. Effective FPCs have strong leaders. These leaders have deep experience and connections in the community and a good feel for the nuances involved in effective political organizing. Overall, we found that the work of FPCs at the local and state level is making a significant difference in our state, providing a meaningful way to pursue food systems policy and change. Our recent article in the Journal of Agriculture, Food Systems and Community Development specifically highlights how local government and FPCs collaborate to shape food policies and programs in different local contexts. Stay tuned for more results from our work. We would love to hear from you about whether our findings resonate in your own food policy council, or if you have ideas for next research steps. Want to get involved in local food system policy-making? Join a food policy council! See reports by Food First or Johns Hopkins Center for a Livable Future's Food Policy Networks for additional information. Harper, A., Shattuck, A., E. Holt-Gimenez, Alkon, A., and F. Lambrick. 2009. Food Policy Councils: Lessons Learned. Food First: Institute for Food and Development Policy.